Hello Friends, I hope you have been well! I want to stop in really quickly to wish you a very blessed 241st Independence Day – continual prayers and blessings to a great country! I would like to know what America means to you on this special day! I hope you have a lovely rest of your day, Dear Friends – Stars and Stripes over Columbia, forever! 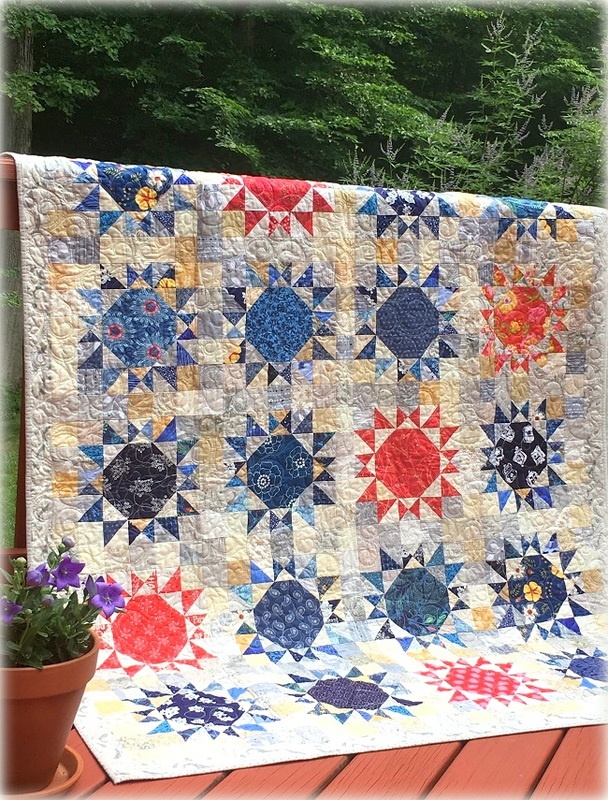 If you are curious about the quilt I posted earlier – it’s Summer Sparkler, featured in American Patchwork & Quilting’s 2017 Calendar for the month of July. 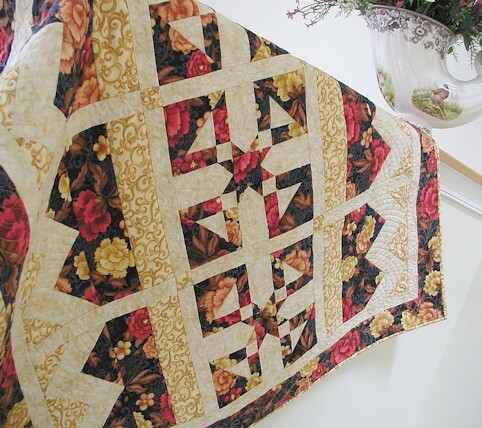 It is a completed scrappy quilt with about 50 fabrics from different manufacturers – RJR Fabrics, Art Gallery Fabrics, Moda, Windham and Benartex. Hello Friends, I hope you are doing well! May is Military Appreciation Month! If your family is/was one, please know that my family appreciates you. 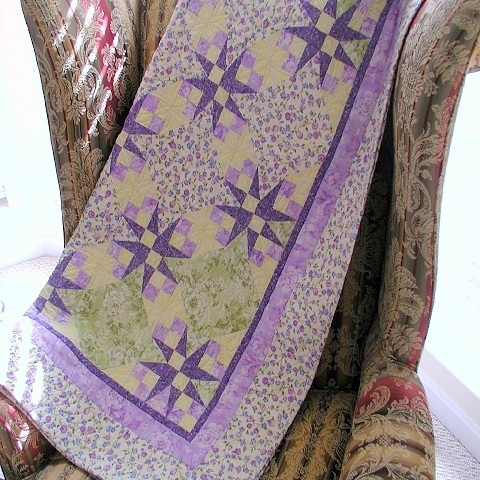 I am happy to share with you another Quilt of Valor free-to-use pattern to bless a service member! 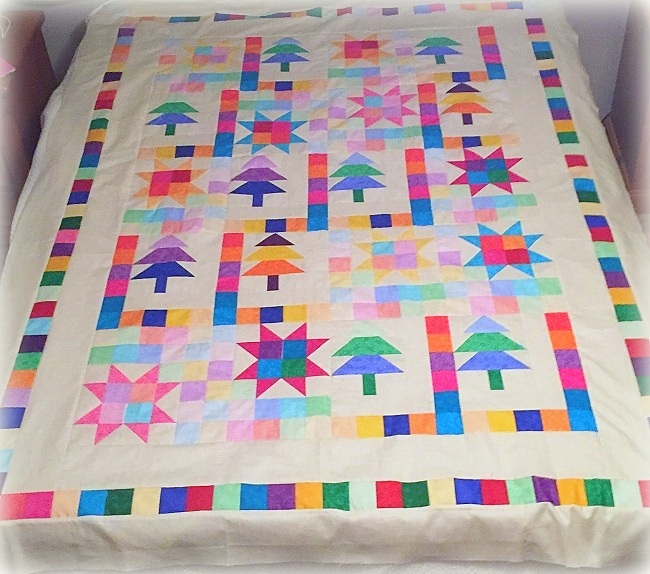 This star quilt is designed using Quilting Treasures’ Love My Hero fabrics. 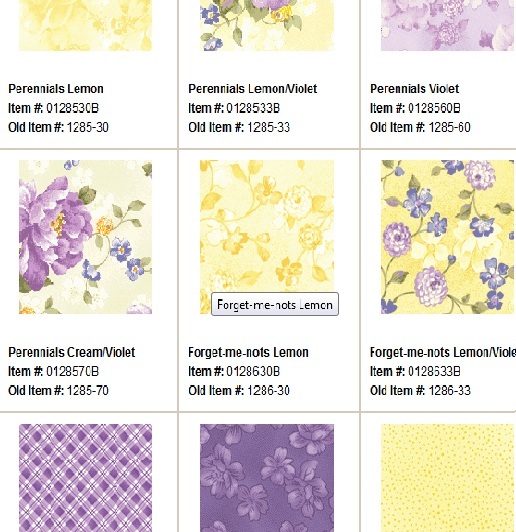 Click here to view the fabric range. 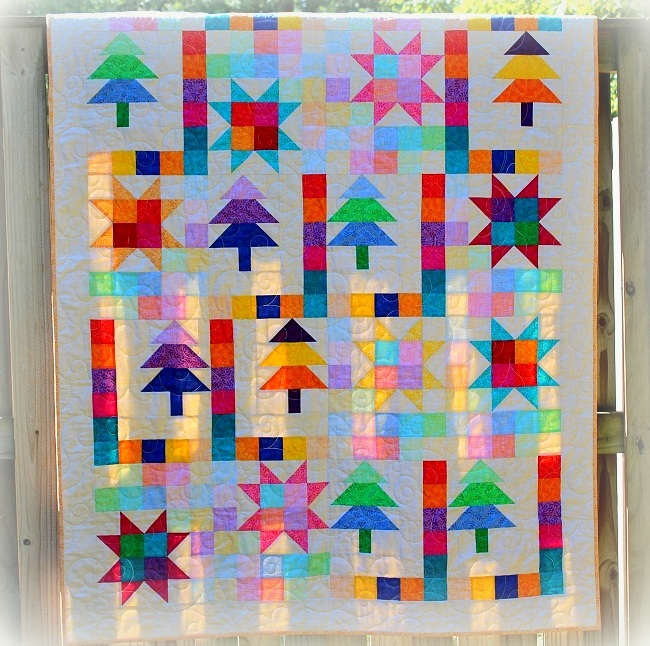 You might notice the star block I used is another variation of my favorite sawtooth star block! I just can’t help it… ha! 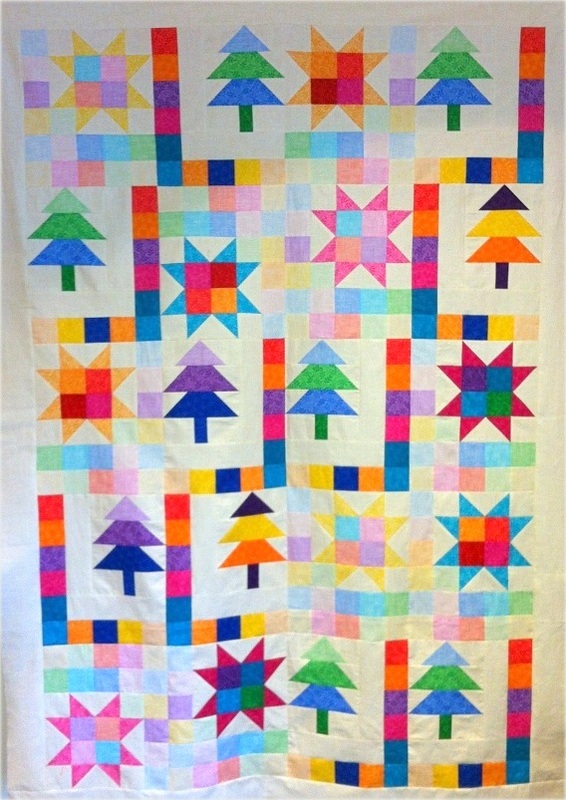 Click here if you are interested in purchasing a kit to replicate the quilt! Click here to down load pattern instructions. Some of you probably remember this picture from a couple of years ago… but this is one of my favorites! 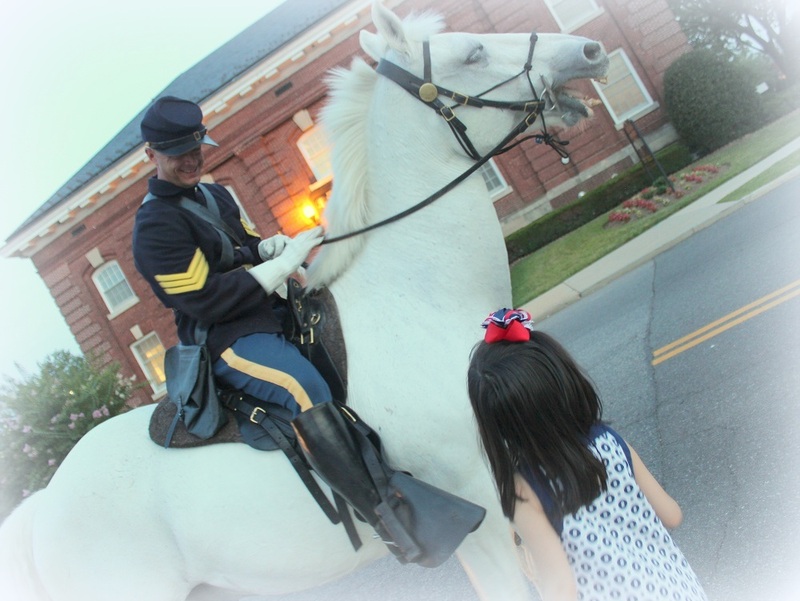 On his way back from work, a soldier-gentleman took the time to stop, smile and look a child in the eye. He patiently answered her questions, and totally made her day! Thank you to all the servicemen who serve with valor, and their very courageous families! May prayers and safe travels always follow you, wherever you are and wherever you go! 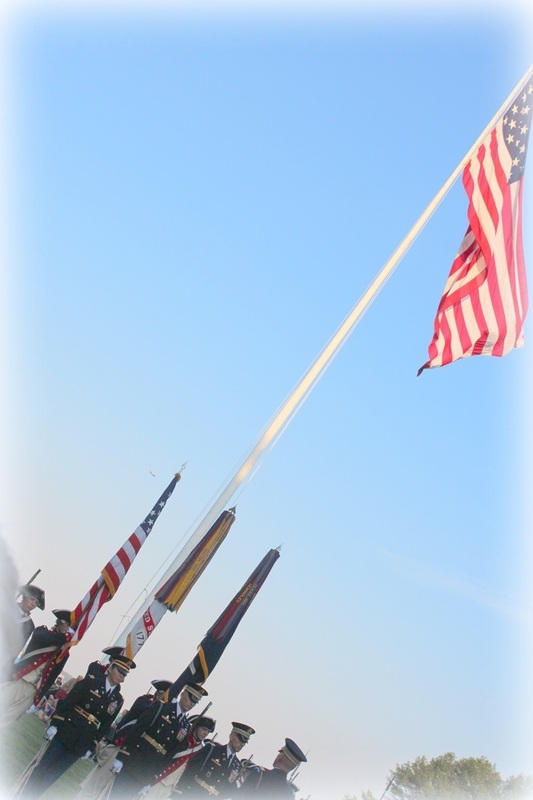 Please feel free to share any stories you might have related to Military Appreciation. I should dearly like to read them. Hello Friends, I hope you are doing well! My life has been a whirlwind, but I am thankful to be where I am. If you know me for any length of time, you will know that I have great appreciation for those who serve in the armed forces. 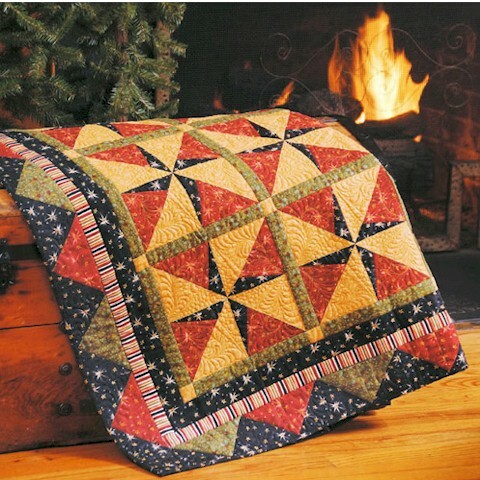 Today, I am sharing with you a Quilts of Valor free pattern using Quilting Treasures’ Monroe group. 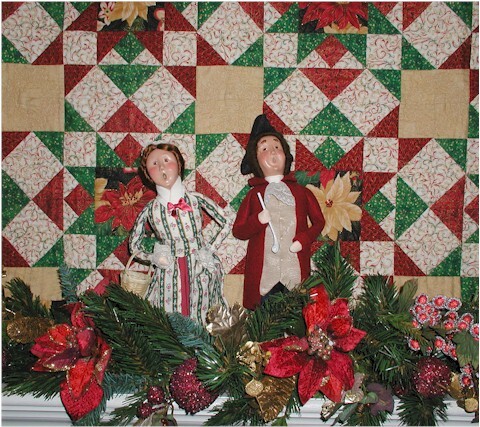 This quilt was displayed at Fall Market last year at Houston, as well as Road to California earlier this year. 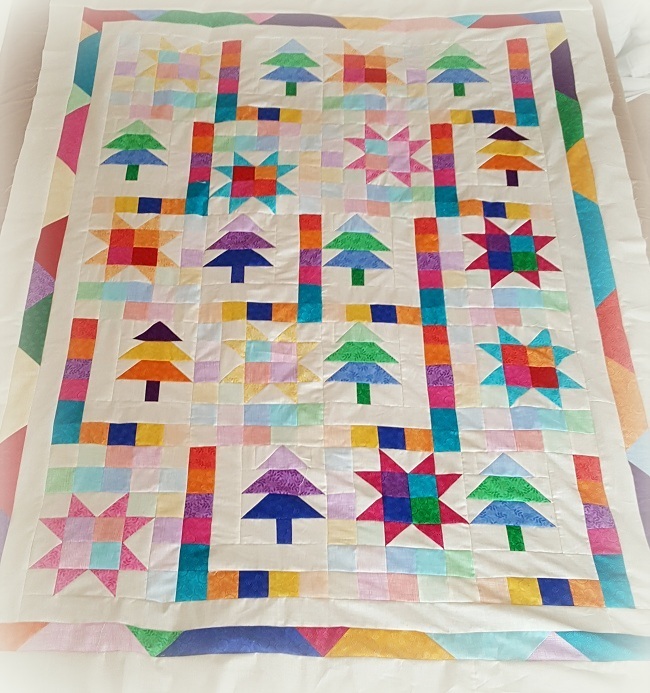 Click here to download free pattern. 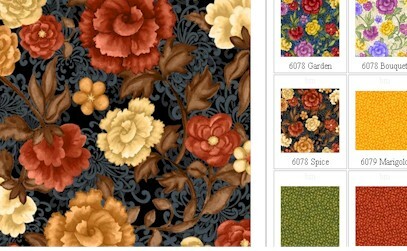 Click here to view fabric line. 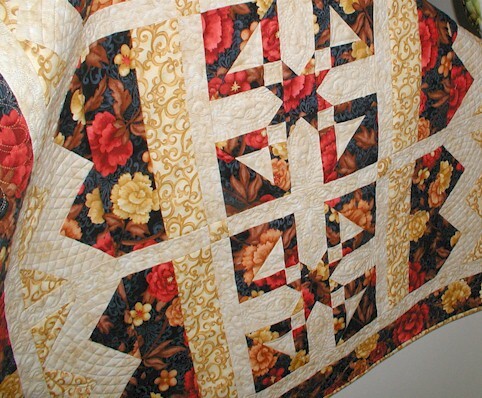 I hope you have enjoyed my Monroe QOV quilt — better yet, you would make it and bless a veteran today! 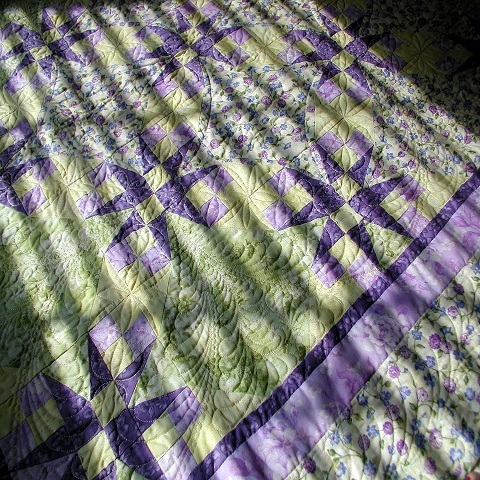 Check out Quilts of Valor Foundation here. Thank you for stopping by. I shall catch up with you later! Hugs to you all. Hello Friends, lots of festivities are in town today!! It’s Inauguration Day!!! Here is my fly-speck contribution to the patriotic festivities today! 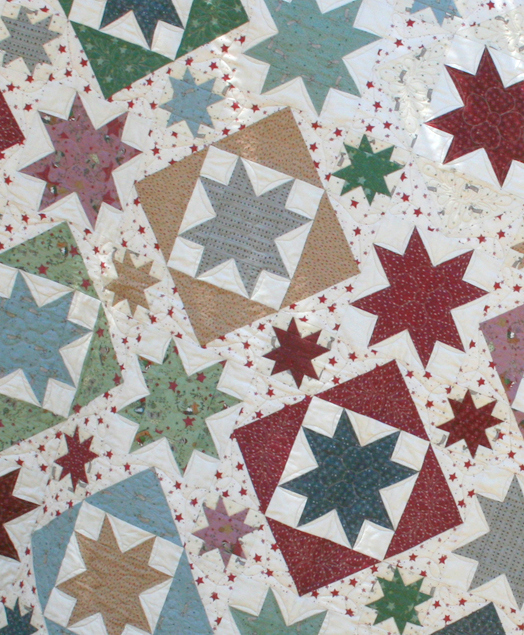 The quilt is designed with Stars and Stripes Forever fabrics by Hoffman Fabrics. 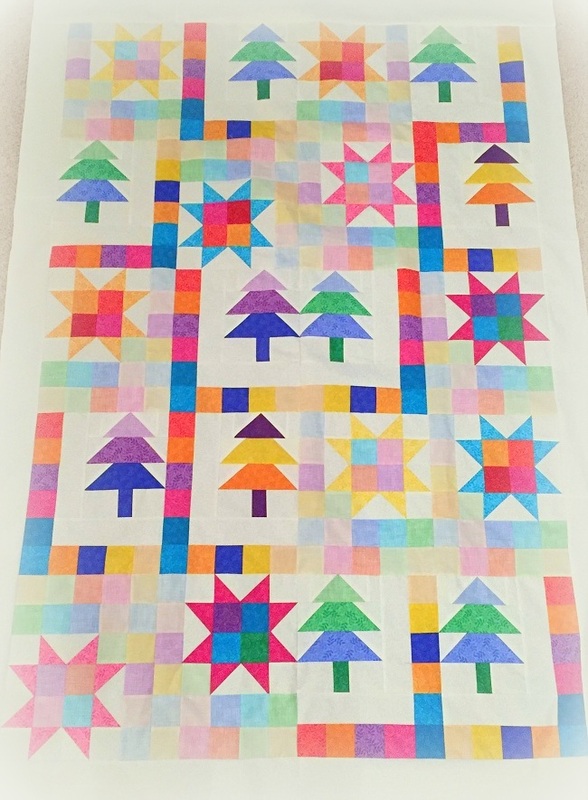 Click here to download free-to-use pattern. With prayers for the future, and always with thanksgiving to God, I hope you have a most blessed day! 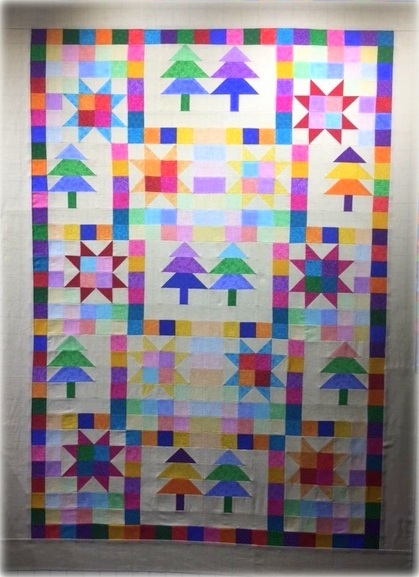 Thank you to some of you who sent in pictures of your completed quilt top to enter the Completion Celebration Giveaway!!! Well done, EVERYONE! 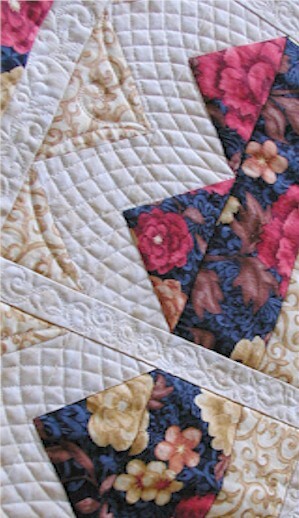 Notice some of the creative ways you can use up the scraps. 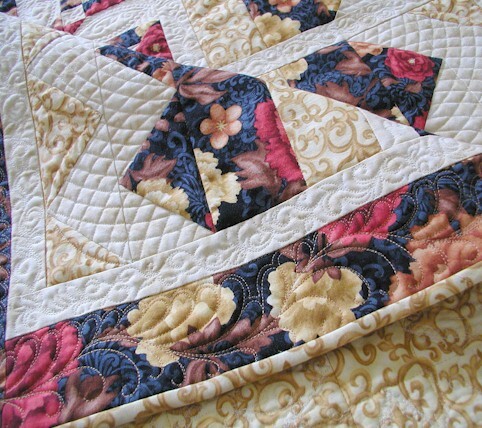 You can certainly sew up four-patch blocks for a smaller quilt or matching pillows! And I am happy to announce the winner of the Completion Celebration Giveaway… it is DEBRA (selected by Random Generator). Congratulations to Debra – an email is sent asking for your mailing address. Thank you all, for playing along!!! 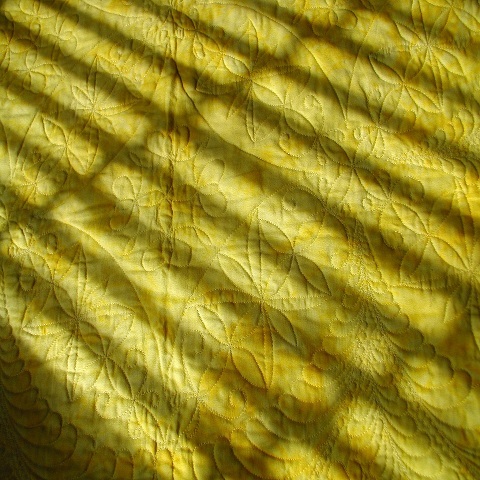 And here is MY own quilt — quilted and bound!!! 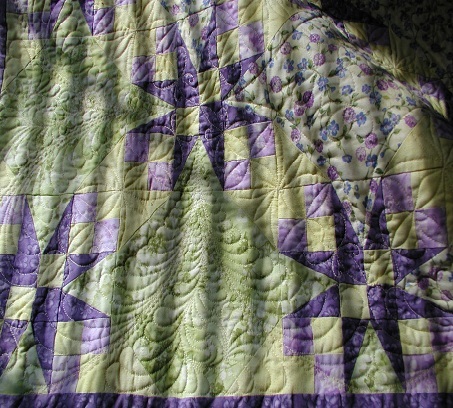 In so many ways, I feel like my own life is a mystery quilt in progress with God being the quilt designer. 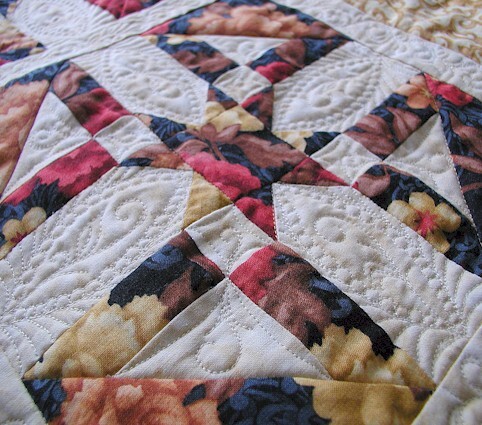 I am confident in the end the quilt will be completed (Philippians 1:6), and all I can do is to follow each and every step the Great Designer has laid out for me — day by day, moment by moment. Hello Friends! I hope you have had a great week so far! Let’s see, Miss Baby and I have done the usuals this week. We also squeezed in our schedule to see a Reptile Show at our local library, where I learned more about certain crawly creepies than I wanted to know. 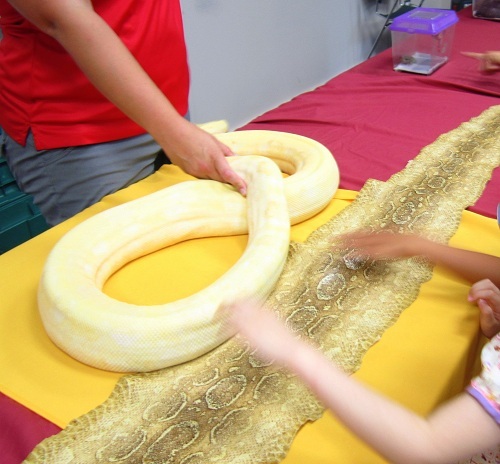 Miss Baby was brave enough to pet this large albino snake (gross!). I am really thrilled about another Australian feature in the midst of all the craziness. Since I am currently working on things I can’t show you just yet, I am happy to show you something I had worked on months ago. 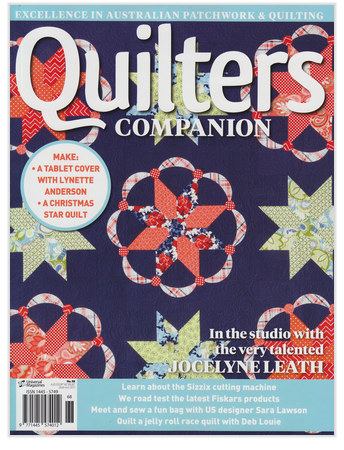 Meet Stars Aligned, my new design featured in the No.68 Australian Quilters Companion issue! You will be able to purchase the magazine on newsstands if you aren’t a subscriber and live in Australia. If not, you are able to easily purchase the digital version here. 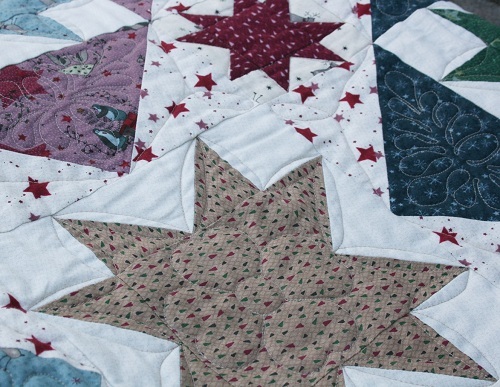 I do like the layers of stars in Stars Aligned. 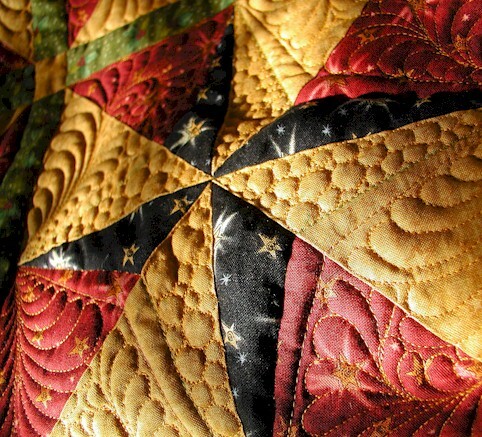 Are you able to spot the starry layers? 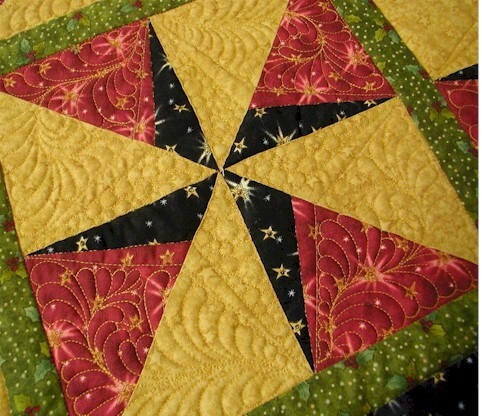 Stars Aligned is made with fabrics from Lynette Anderson‘s Starry Night and Bread & Butter, released by RJR Fabrics. Fabrics are now in stores. 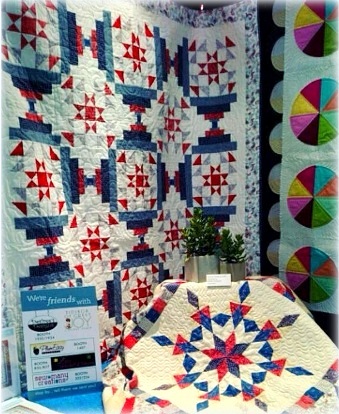 Since the actual sample, made by Jill – a wonderful sample maker, is in Australia, Lynette graciously sent me these pictures from the Down Under. 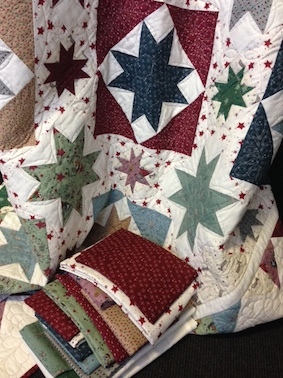 If you wish to purchase the quilt kits, Lynette has them for sale here. 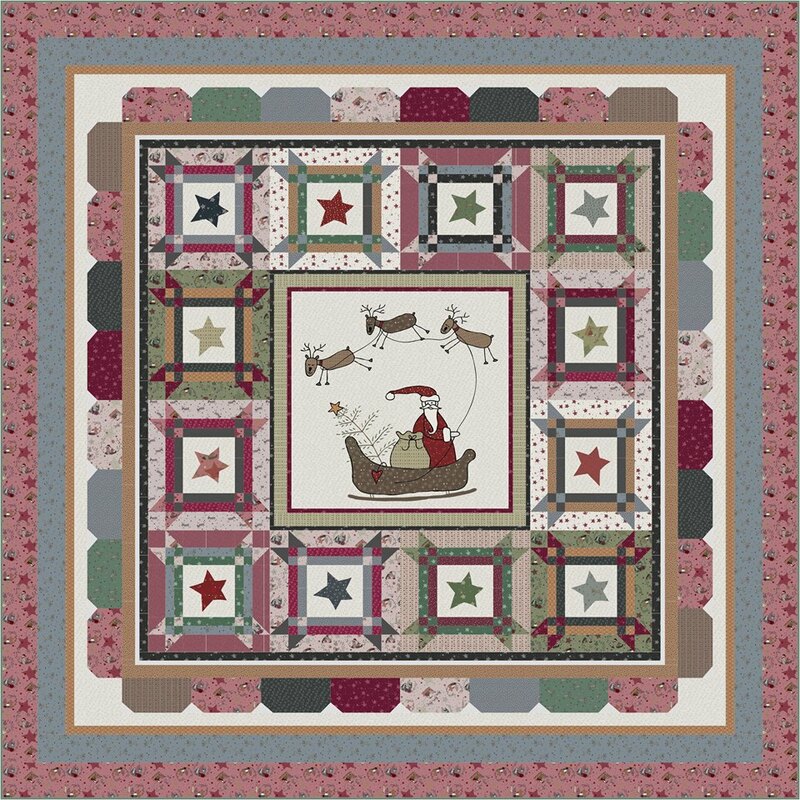 Lynette also has the kits for Santa’s Sleigh (download pattern instructions here) for pre-order here, our joint design using the same Starry Night fabrics. Thank you so much for stopping by to read about snake and stars. 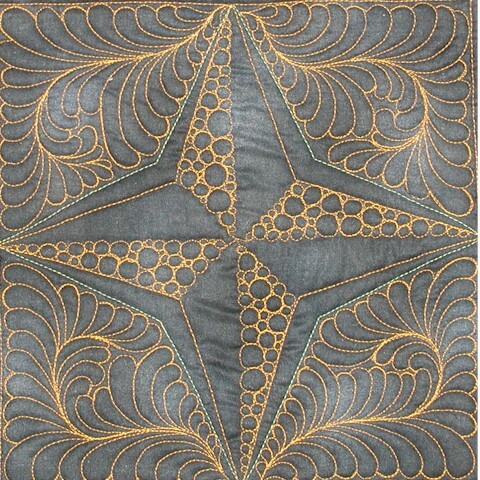 I am not nearly as excited about my slightly increased knowledge of snakes as I am about my continuing starry quilting journey! 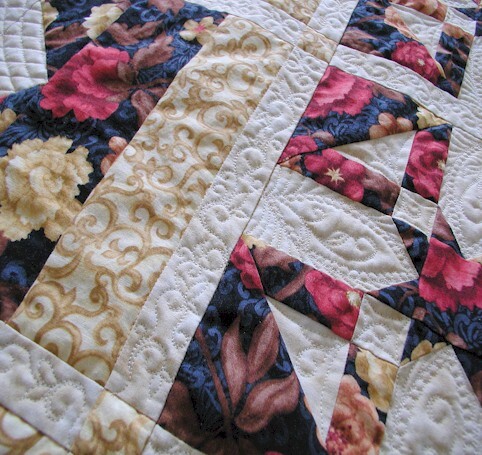 Click here to view the exhaustive list of my featured designs and projects. Dear Friends, I hope you are doing well. The weather at my end of the world seems to be warming up, and we are quite excited about that! The warm weather is just what we need to welcome in some sweet blossoms in real life. 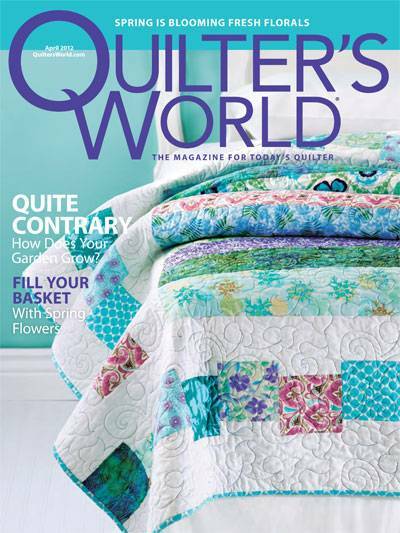 That’s what I had in mind when I designed my Sweet Bouquets quilt for Quilter’s World‘s April 2012 issue. 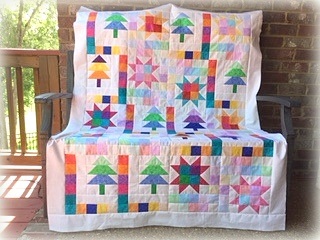 I also unofficially named this quilt “Bright and Morning Star” because the fresh and soft color palette of the quilt reminds me of the hope I have in my Lord. 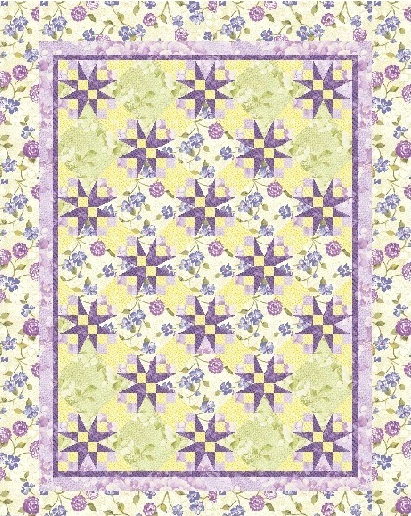 The quilt used fabrics from Eleanor Burn‘s Perennials II collection, released by Benartex. 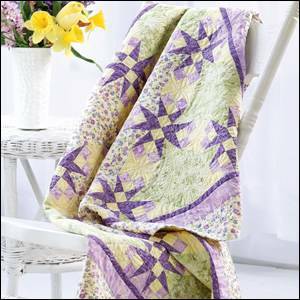 I love the garden-feel of these fabrics. 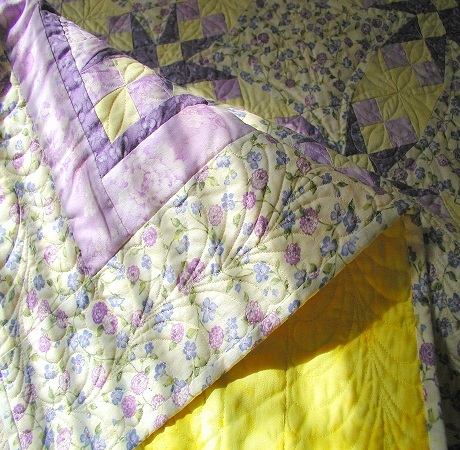 Now to the quilting – I set out to challenge myself to quilt something that would look totally different on the back compared to the piecing scheme on the front. Now, see if you know what I mean… the stars on the front don’t really show up on the back. 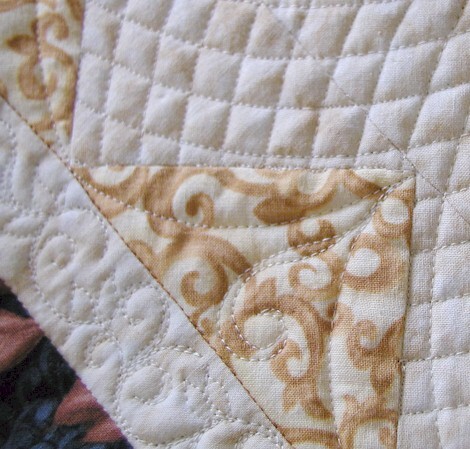 Instead, a variation of pickle dish/orange peel quilting scheme does. 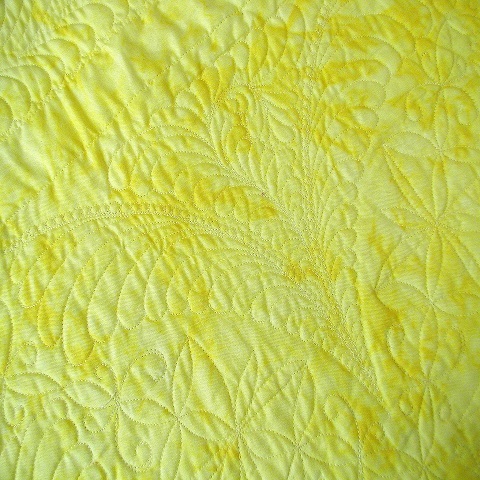 Again, quilting was done using Aurifil‘s Mako 50 Cotton over Hobbs Tuscany Silk batt. 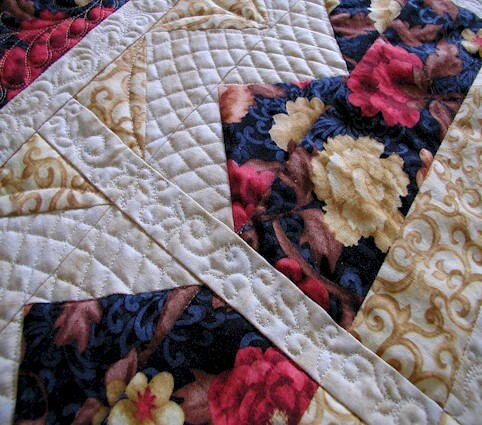 What spring projects do you have on your plate this year? 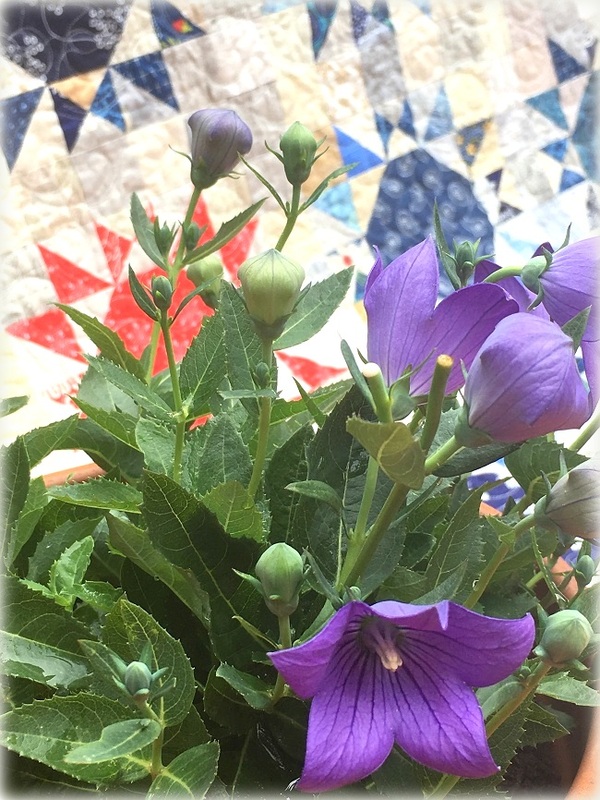 Do share – I am anxious to know! Thanks for stopping by. I appreciate your visits, as always. Till next time. 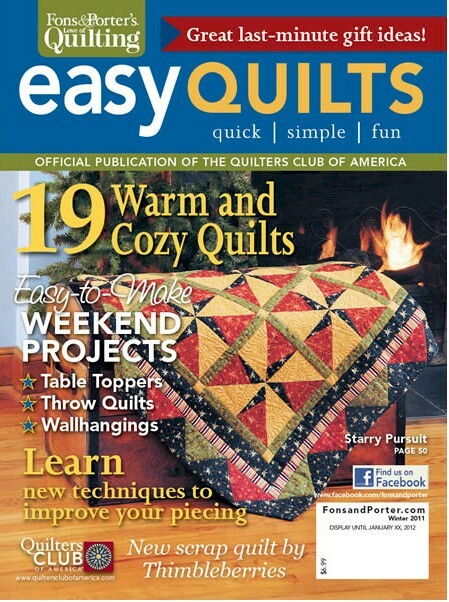 My Starry Pursuit quilt made the cover of Fons & Porter‘s Easy Quilt (Winter 2011)! I am over the moon and… stars. 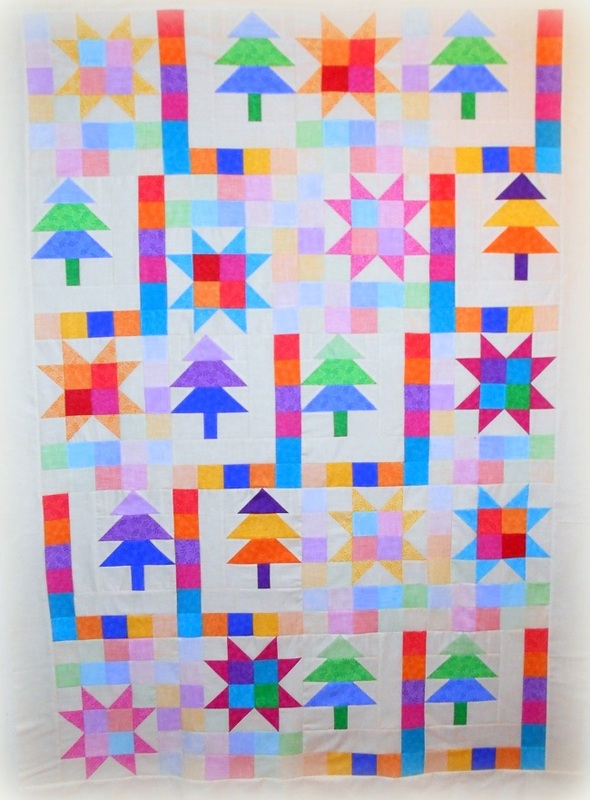 After all, the quilt is called Starry Pursuit! 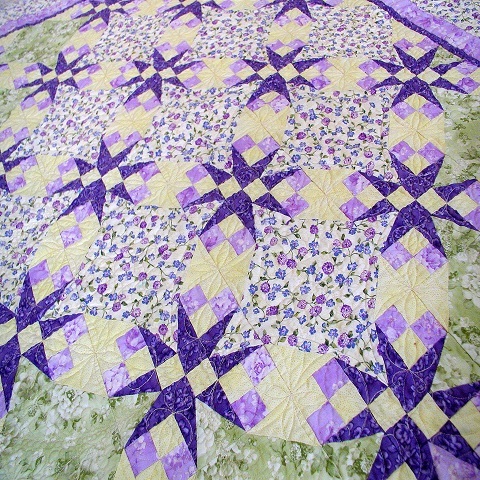 I will wait till I do a proper post on Starry Pursuit to share with you why I had picked the name for the quilt. Until then, take care! 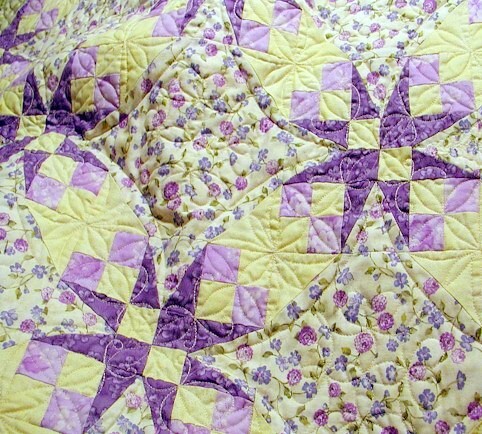 My Autumn Stars quilt (renamed Thanksgiving Topper) is offered as a free featured pattern in Quilter’s World‘s October 2011 issue. 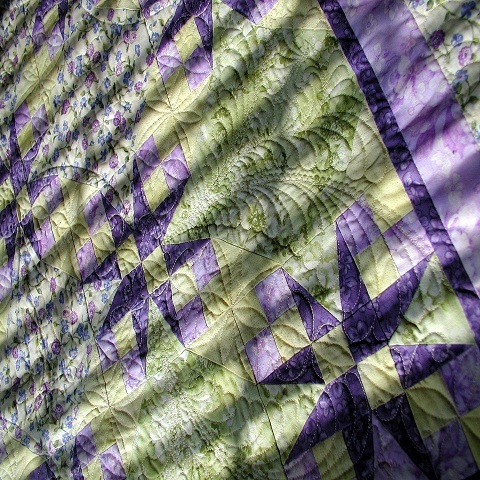 The focal print fabric is from Blank Quilting‘s Mayu collection. 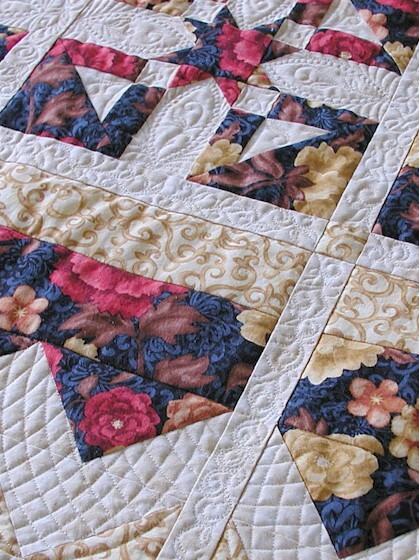 I like using large-scale floral print in piecing because the resulting cut pieces always capture different portions of the print — making your pieced blocks look different from one another! 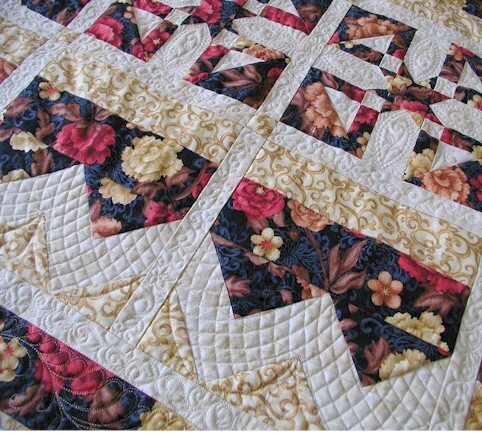 Here are a few photos showing the quilting. If you are wondering about the curve cross-hatching, I have written about it here. 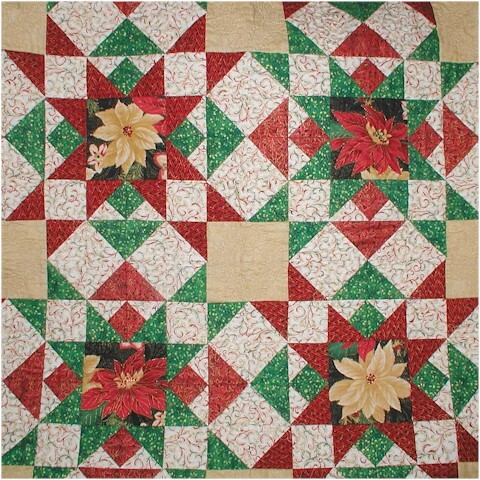 The oval shapes with the “sprig thingamagigs” in the center are meant to mimic the old fashion cookie press from the Old World. 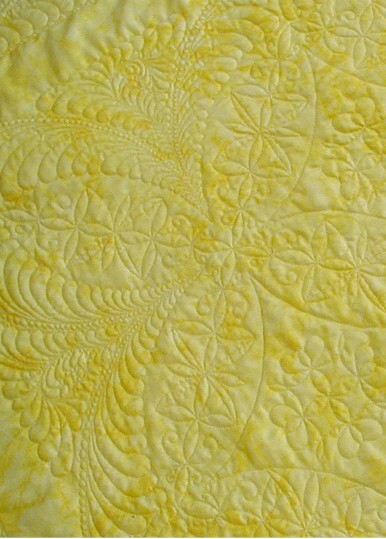 I also picked up the scroll-ies in the coordinate fabric to quilt in the sashing. 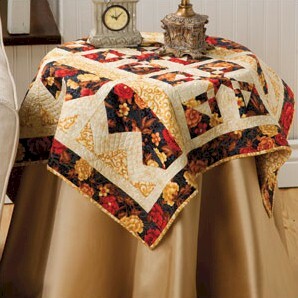 This 36″ square quilt makes a nice table topper as shown in the official Quilter’s World picture. 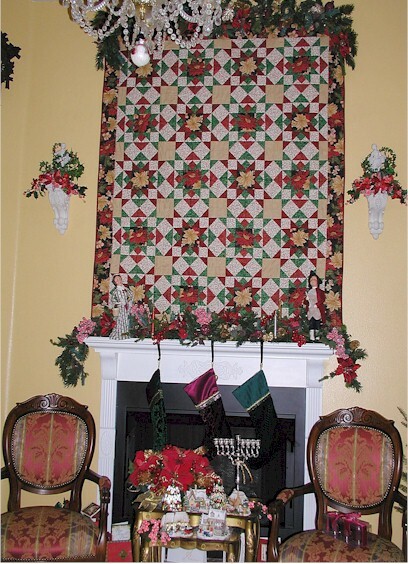 You can download the pattern by clicking here. Please email me if you have trouble accessing the file. 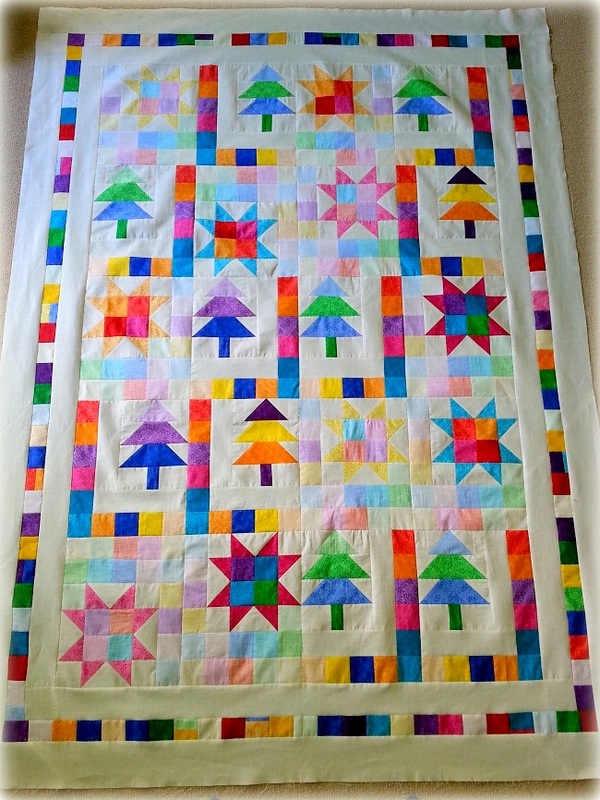 This will be a quickie – but I wanted to show you some updated pictures of the Christmas quilt I was working on a couple of weeks ago. 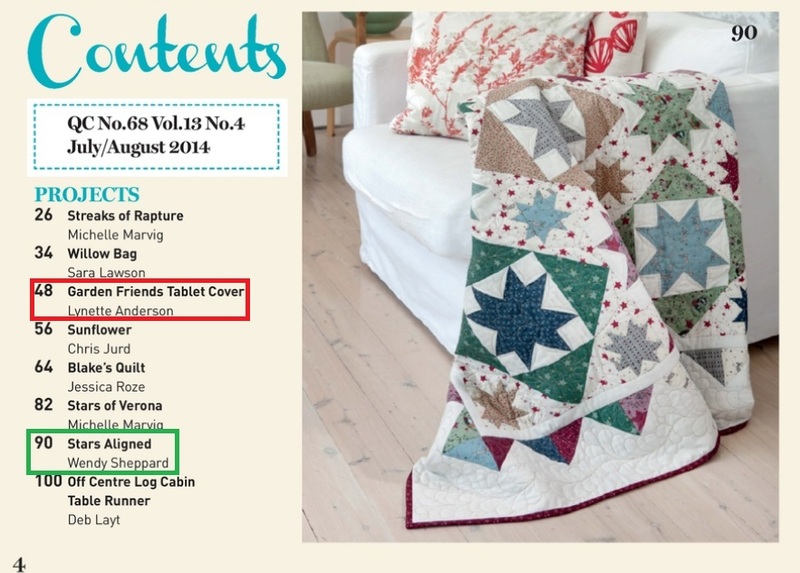 More pictures to come once it is officially published in “The Quilter”. I am working on another deadline. So, I will chat with you later! 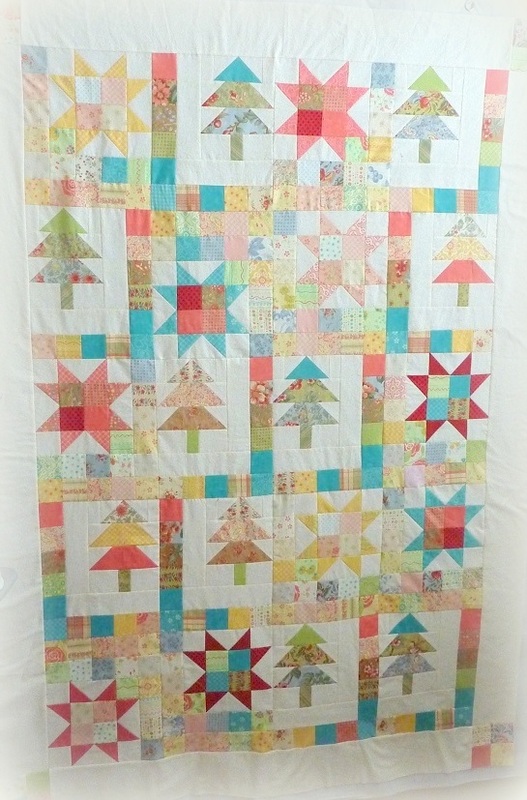 I am hoping to be able to complete a dish-aholic post I have been working on here and there in the past few days. Stay tuned! Have a blessed day, everyone!